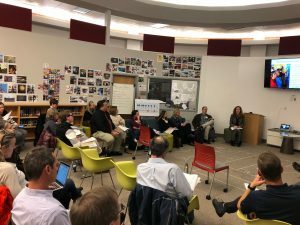 Park City School District held a learning leaders forum last night, Dec. 6, to discuss the educational vision for the district in the years to come. Teachers and administrators met earlier in the evening to discuss current and future innovations in learning, the use of technology, personalized education, project-based curriculum, establishing professional learning communities, enhanced professional development, and the importance of relationship building. Educators also concurred with the results of the first community online survey asking the top three skills Park City High graduates should have: 1) critical thinking/problem solving, 2) communication skills, and 3) study skills/time management. PCHS Principal Roger Arbabi leads a small group discussion about the needs of students in the coming years. “The committee and representative community members have provided excellent insights and feedback to date that will keep the Park City Schools leading the way in public education,” said Superintendent Jill Gildea. The Steering Committee reviewed the proposed guiding principles for the district’s educational master plan. 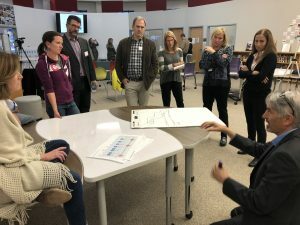 The principles were developed by 75 educators, students, community members, Planning and Steering Committee members during a day-long Future of Education Summit in October. – Learner-centered experiences best support student growth. – Positive and healthy schools promote safety and security. – Meaningful engagement demands real-world learning. – Flexible, adaptable spaces and programming support all students. – A commitment to inclusivity provides greater access for all. “These principles will guide the development of our educational programs and define what student success looks like,” said Superintendent Gildea. Steering Committee hears from teachers and administrators. Upcoming learning leaders forums will include conversations about identifying key spaces for learning (Dec. 18), reviewing how spaces can be teaching tools (Jan. 15), developing space by space descriptions and review condition assessments (Feb. 12), and review teaching approach and space recommendations (March 12). Teachers and administrators will meet from 3:30-5:30 p.m., and the Steering Committee meets from 5:30-7:30 p.m. The public is welcome to attend and observe Steering Committee meetings. All meetings will be held in the PCCAPS collaborative space at Park City High School. Superintendent Gildea encourages the community to be engaged in the process and offer feedback along the way. The district is currently asking for the public’s best ideas on what the future of education should look like in Park City. All agendas, minutes, and meeting recordings can be accessed on The Future of Learning website. The next community engagement open house is planned for Feb. 6, and the website will have several online surveys to seek public input. Options and recommendations will be presented to the Board of Education on April 15. The board will review the final recommendations and consider adoption at its May 21 meeting.